Submitted by Mason Hoberg on Nov. 8, 2017. Guitar stands are kind of like a belt. They’re cheap, and you’re not going to see a lot of people debating the pros and cons of different models on forums, but if you don’t get a good one you’ll end up regretting it. So rather than trying to search through scores of different models through online retailers, check out our recommendations. 94 out of 100. Incorporating 350+ ratings and reviews. 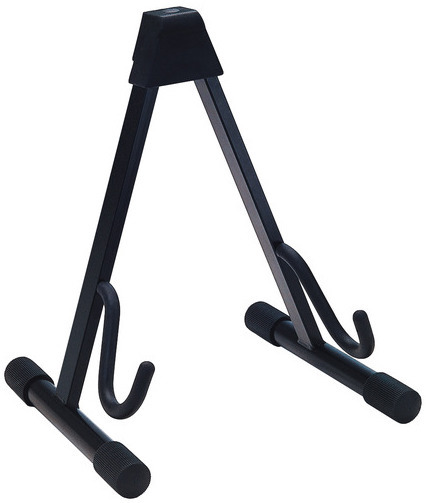 The K&M 17540 Electric Guitar Stand is a very durable and stable A-Frame guitar stand. The cool thing about this stand is the arms that hold your guitar. They have more of a curve, which seats your guitar more securely than stands that have flatter arms. The 17540’s product page states that it’s made from Swiss Steel, a steel manufactured by the Schomlz & Bikenbach group. The main benefit of this is that you can be more confident that the steel used in the stand isn’t going to have any structural issues, which helps to offset the stand’s cost. Lastly, the stand also comes with two adjustable settings. The stand features a locking setting for both thin and wide bodied electric guitars. Think of a Strat vs. an Epiphone Casino. It’s still not going to be a good fit for acoustic instruments, but it’s a great option if you’re going to be using this stand with several different instruments. 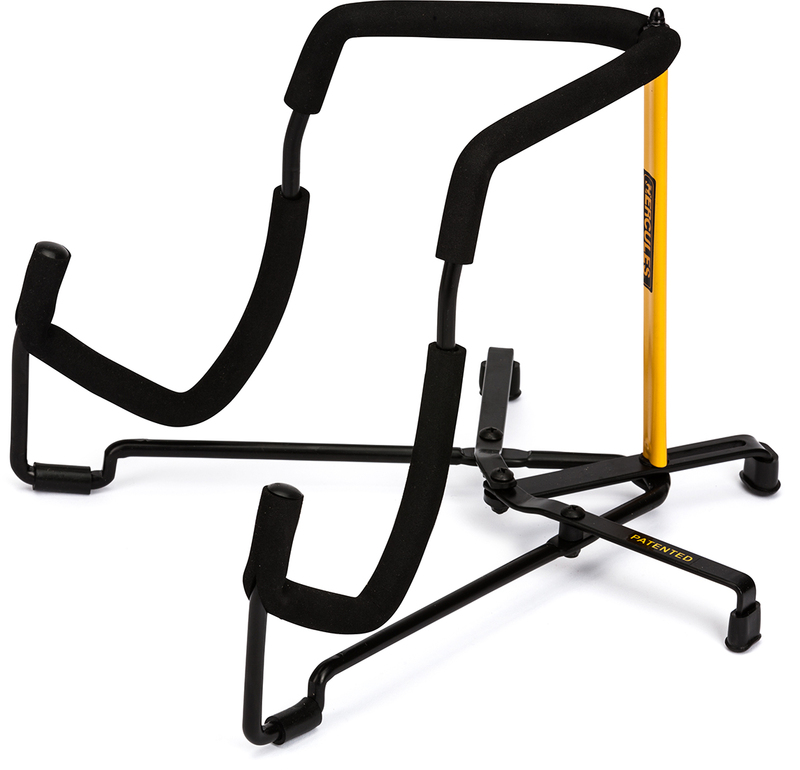 The Hercules GS302B Travlite guitar stand is arguably one of the best available if you’re looking for a portable stand. It folds up almost completely flat, and due to its construction its overall footprint is lower than other stands of this type. NB: Some retailers describe this stand as not being safe for guitars with nitrocellulose finishes, however that is incorrect and we have confirmed directly with Hercules Stands that all their guitar stands with are nitrocellulose safe. It is also pretty stable compared to other travel stands, which it owes to the configurations of its legs. Rather than using a tripod or a-frame configuration, the Hercules GS302B actually has five legs. This gives it a wider surface area, which compensates for the stand’s lower weight. 93 out of 100. Incorporating 350+ ratings and reviews. The Hercules GS412B comes with a different design, where rather than having a cradle for your guitar, your instrument will actually be free floating. The stand comes with a backrest that helps stabilize the instrument. Because of this configuration, and the weight of the stand, it’s going to be more stable overall than an a-frame stand. However, it’s also going to be less portable. The stand can still easily be transported in a car, but you’re not going to be able to throw it into a gig bag. Hercules notes that the GS412B comes with special foam, which is designed to protect instruments at every contact point. Brent Gerlach from Hercules Stands' parent company KHS America told us, "The foam used in our stands is made of a rubber called SFF, Specially Formulated Foam Rubber, that has been designed and tested to be safe for all guitar finishes". 93 out of 100. Incorporating 1000+ ratings and reviews. The Hercules Stands GS414B Auto Grip System Guitar Stand is very similar to the GS412B, with the most substantial difference being that the 414B has a greater maximum height. The dimensions of the stand are the same when folded, as is the weight. Because of this, while both stands can hold bass guitars, the Hercules Stands GS4114B is the better option if you’re looking for a stand to exclusively hold a bass guitar. This is doubly true if you have a long-scale bass guitar, as the GS412B reportedly doesn’t hold extended length bass instruments very securely. Hercules stands are said to have great coverage for your instrument, so you shouldn’t have to worry about any scrapes or dings. Like the GS412B is the GS414B comes with the brand’s specially formulated foam which is safe for use with nitro finishes. As you’d guess from the name, the Hola! Universal Music Guitar Stand is a guitar stand that can hold acoustic, bass, and electric guitars. The stand accomplishes this through “grooves” in the cradle (the part that holds the guitar up). Different instruments fit in different part of the grooves, which allows instruments to be held up at the proper angle regardless of their size. The stand also fits folds flat (and in half) in order to store more easily. Like other a-frame stands, the Hola! Universal Music Guitar Stand can fit in the main pocket of a gig bag without too much difficulty. The manufacturer told us that they use a form of thermoplastic elastomer (TPE) that is safe to use with nitrocellulose finishes The stand also uses velveteen rubber padding at all contact points, which will help to ensure that you guitar doesn’t get any scrapes or dents while you’re putting the guitar on the stand and taking it off to play. 92 out of 100. Incorporating 900+ ratings and reviews. The Hercules Stands GS415 Hanging Guitar Stand is also similar to the GS414B and GS412B, with the main difference between the three models being their height. The GS415 goes to a max height of 45.2”, making it long enough for just about any bass guitar. Like the other Hercules Stands featured on this list, the GS415B is a great “at home” stand. It’s stable, the foam provides excellent coverage on all contact points, and it has a large enough length to accommodate any guitar in your collection. It does fold down to make it somewhat easier to transport, but it’s not as easily transportable as you’re average a-frame stand. You won’t be able to fit it in a gig bag, but you’ll still be able to throw it in the backseat of a car or truck without running into any problems. 92 out of 100. Incorporating 1200+ ratings and reviews. 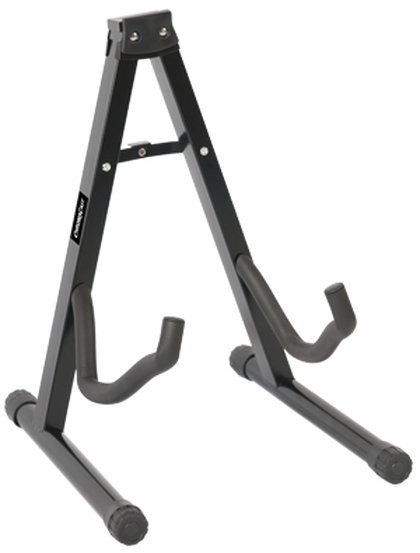 The Chroma Cast Universal Folding Guitar Stand is a great, simple, and affordable guitar stand. 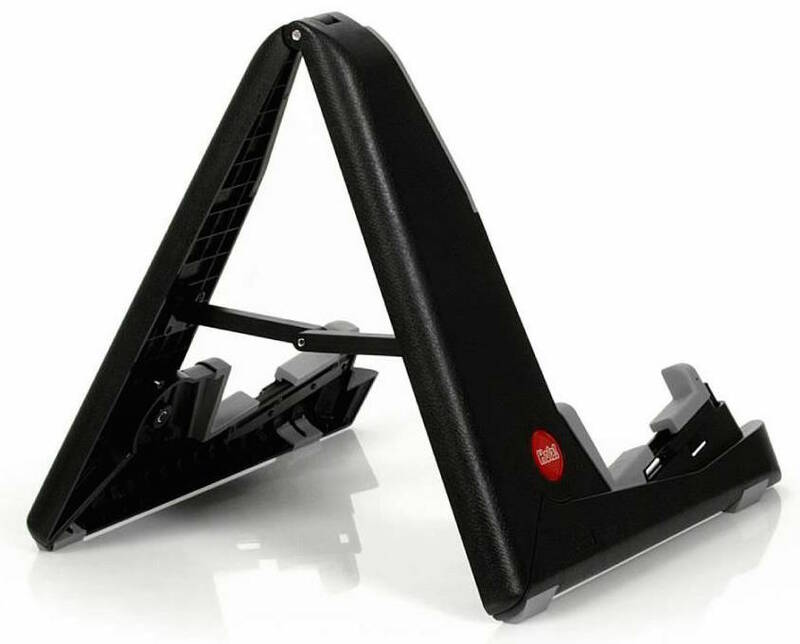 The stand uses an a-frame configuration, which is great for anyone looking for a portable guitar stand. The Chroma Cast Universal Folding Guitar Stand is also more lightly built than a lot of the stands on this list, making it even easier to carry to and from wherever you need it. The stand, like many other a-frames, is also very easy to fold up. The stand itself is also on the small side, so it will actually fold up smaller than many of the other stands on this list. The only thing to be aware of with this stand is that it doesn’t have any extra features. It’s very much a “what you see is what you get” situation, so if you want something that you can tweak more to your own needs you may be happier with another stand on this list. The length of a stand’s cradle controls the angle that your guitar is going to rest on. A guitar stand meant for an acoustic guitar is going to have a wider overall length to accommodate an acoustic guitar’s body. Because of this, when you set an electric guitar or electric bass in a stand meant for an acoustic it’s going to lean back farther than it should. This is going to make the stand take up way more room than it should, and it can potentially also cause stability issues. The inverse is also true, because stands meant for electric guitars may be too small to properly seat an acoustic guitar. Most musicians are going to run across two different types of stands, A-Frames and Tripods. Both of these stands have their strengths and weaknesses, and it’s important that you get the one that’s going to work best for your situation. A-Frame stands sit low to the ground, and lack a neck cradle. Because of this, they’re very portable. They’re a great option if you’re looking for a stand that you can fold up and throw in a gig bag or backpack. Though with that being said, they aren’t as stable as tripod style guitar stands which have a neck cradle. A small bump to your guitar can send it falling down to the floor, so it’s not a good fit if you’re looking for a stand to put in a crowded area. Tripod stands, while more stable, are harder to transport than a-frame stands. For many situations, portability is a prime concern when looking for a guitar stand. If this is the case for you, your best bet is definitely going to be an a-frame stand. Because you can fold them up so easily, they can be stored just about anywhere. You can also find models that are made from thin pieces of metal, and fold up almost completely flat. If you have a nitrocellulose finished guitar (which is the finish that comes on most Gibsons), you need to be more careful about which stand you use. Nitrocellulose can react with the plastic found on many guitar stands, which will essentially destroy your finish in the affected area. Because of this, you have a couple different options. The first, and cheapest, is to simply drape an old t-shirt on the points where your stand will contact your guitar. However, it happens to slip off of the points it needs to be (like at the bottom, where you won’t easily see it) you could still end up with a damaged instrument. To be on the safe side where your stand won’t damage your nitrocellulose finished guitar, you’re better off buying a stand that’s is clearly denoted as being nitrocellulose safe. We looked at all the guitar stands available from major American music equipment retailers and selected the 28 of the most promising to put on our short-list which you can see in our public music gear database. We then collected feedback from musicians about each stand from their 5 star ratings, forum discussions, video reviews, and gear review websites. Next we processed all 12,900+ ratings and reviews using the Gearank Algorithm to produce rating scores of out 100 for each one. After selecting the highest rated options to recommend, we then contacted the manufacturers to find out which ones were definitely nitrocellulose safe and only labeled them as such if we had positive confirmation. For more information about this process see How Gearank Works. Submitted by Anonymous (not verified) on Feb. 16, 2019. What about Mugig Guitar stands? Submitted by Jason Horton on Feb. 19, 2019. They didn't have high enough ratings at the time we published this guide, but they will be considered again when we next review this category.